Enhanced dynamic wedges (EDW) have been in use for over a decade now . EDW exists as a mode that can be set on a linear accelerator allowing one assigned blocking jaw to move across the radiation field during exposure. For the Varian 21EX linear accelerator used here, the wedge effect is created by moving the upper ŷ-axis jaw. The exact position of the jaw is defined at each equally spaced segment by a strict set of values. These positional values of incremental dose are data belonging to the golden segmented treatment table (S G ). Data from the S G is a function of energy and field separation of the moving jaw only. There are many different wedge angles that can be created using these tables. The segmental motion of the jaw, designated for a 60˚ enhanced dynamic wedge, can be modified to create enhanced dynamic wedges of alternate angles. This article discusses how the accuracy of the extension of the MU fraction can be improved with the introduction of an additional correction factor. Although the inaccuracy in the total EDWF can be significantly large for certain field separations, a correction factor applied to the result from an extension of the MU Fraction Approximation can generate improved results. Accumulated data will be compared to Varian Eclipse Treatment Planning System data and previously successful research. Finally, a matrix of corrections will be presented that enables calculations which satisfy the accuracy required clinically in the determination of the total EDWF for any wedge angle currently available on the Varian 21EX linear accelerator. Off-axis factors are known to have primary and scatter components . Variations in these components have been seen for EDW factors in comparison to open fields, differing by up to nearly 2% for the largest fields . Applied off-axis EDW factors for asymmetric fields have also been experimentally studied. Researchers found that such factors do not account for off-axis primary fluence and energy variations caused by the beam flattening filter. It is for these reasons that scientists have chosen the direct route of incorporating the central axis EDW factor and the associated off-axis ratio into an all inclusive total EDW factor. Consistent with published research found, all EDW factors mentioned here are total enhanced dynamic wedge factors. Typically, hard wedges corresponding to angles 15˚, 30˚, 45˚ and 60˚ are provided for customers. A solution to obtain wedge effects at intermediate angles may be achieved by combining open fields to a series of exposures using any one of these wedges, which is the basis for the advent of a universal wedge. Petti and Siddon explained how a segmented treatment table (STT) for any angle of wedge can be generated using the golden segmented treatment table (S G ) for a 60˚ EDW similarly . However, they note that the wedge angle can be achieved without an additional wedge filter. Instead, it can be achieved using jaw motion already intact within the collimator. The numerator represents the fraction of monitor units used while motion is carried out from the initial position of the moving jaw to the central axis. The denominator represents the fraction of monitor units used while motion is carried out from the initial position of the moving jaw, across the center, to the final position. It is important to note that the sign of any value for Y is negative for jaw positions opposite the side of the stopping position with respect to the central axis. Gibbons extended the MU Fraction Approximation, restricting the point of calculation to be located at the geometric center of the initial open field. The equation for finding geometric center is Y 0 =(Y IJ +Y FX )/2, where the sign of any value for the calculation position (Y) is likewise negative when it exists opposite the side of the stopping position with respect to the center of the initial open field. This is true regardless of whether the field is awkwardly asymmetric. Fit parameters (a 1 and b 1 ) are involved in his approximation of the S G data. Other parameters (a and b) are used to describe the pattern of intensity fall-off just outside the photon field. The value b± =b 1±b interrelates the effect of dose delivery with S G .
As was pointed out by Wichman, this formalism does not satisfy the need to have points outside of the center of field . This may be important dosimetrically, since the central axis is blocked for several common clinical circumstances. When some point of calculation, taken somewhere other than in the center of the field, lies within the first sweep, the dose is underestimated. Further, when the point of calculation lies beyond the center of the field in the second sweep, the dose is overestimated. Prado et al. experienced these problems using the ADAC Pinnacle Treatment Planning System. ,, Independent of the calculation point location, the Prado group identified a method of correcting the field size dependence empirically, by separating the total EDW factor into three terms: (1) the central axis factor; (2) a non-linear scatter correction term, which is a function of the moving jaw field length; and (3) an off-axis correction factor. Interestingly, the validation of this technique found up to 3.5% disagreement versus measurement of off-axis points located 5cm or greater with field sizes greater than or equal to 20x20 cm 2 . The addition of the third term is more cumbersome than the MU Fraction Approximation, though not limited in that technique to central axis usage only. Wichman was concerned with this same issue regarding the MU Fraction Approximation. He showed that by replacing the geometric center variable Y 0 with the position of the point of interest Y i in the third term of the numerator in Equation 4, the drawback of this required central axis point of interest limitation is removed. Using this methodology, however, forces the calculation point of interest to be the center of the initial open field . No treatment planning system comparisons were done. Measurements from this EDWF research revealed within 3% accuracy for 6MV and 18MV x-rays. Kuperman sought a remedy for the same stated limitation of the MU Fraction Approximation, permitting off-axis calculation points to be used with even better accuracy without a third term. He modified the extension equation by applying an analytical shift in the point of calculation . The shifted value Ỳ for the position of any particular calculation point (Y) is found from Equation 5. The difference in the total EDW factor calculated by the MFA theory and by the shift method was reviewed by Kuperman using a symmetric field of 20x20 cm 2 and placing the calculation point across the length of the field. The calculation point was changed in 2.5 mm intervals along directions heel and toe using first the extended MU Fraction Approximation and then his shift method. After analytical tabulation, measurements were taken for theoretical validation. The shift method proved to be accurate to within 1.0-1.8% for both 6MV and 18MV beams. For 6MV specifically, the MFA theory was nearly 11% off in the heel direction and nearly 6% off in the toe direction for a 60˚ wedge. Similarly for 18MV, the MFA theory was nearly 6% off in the heel direction and nearly 4% off in the toe direction for a 60˚ wedge. Differences existing for the other wedge angles were not presented. This article examines the difference between the extended MFA theory and the shift method for both 6MV and 18MV photon beams of a Varian 21EX linear accelerator for 10˚, 15˚, 20˚, 25˚, 30˚, 45˚ and 60˚ EDW angles. The difference plots between the two processes create a pattern of variation. Based on the emerging pattern, a matrix of linear equations can be implemented to improve the extended MFA inaccuracy. Each equation exists as a function of only the distance from the center of the field to the point of calculation. There are separate equations for each wedge angle and energy. To correct the resulting total enhanced dynamic wedge factor produced in the extended MFA theory, one simply needs to use the resulting correction value by the solved equation specific to that energy, wedge angle and geometry. The equations introduced here may be successfully applied even when the calculation point is not forced to be located at the center of the field. A comparison between the extended MU Fraction Approximation and the shift method for the determination of the total enhanced dynamic wedge factors are introduced in this article for 18MV photon beams having a 20x20 cm 2 field size. The plot represents the ratio EDWF MFA /EDWF Shift . The magnitude of variance described by Kuperman was again seen here for the 60˚ wedge, and were correctly inverted. Well over 6% difference is seen between his method and the extended MU Fraction Approximation in extreme off-axis point placements. As introduced in this research only, for other wedge angles the difference is reduced significantly. For example, using a much smaller angle of 10˚ for both energies, the dissimilarity is less than or equal to 1%. The difference is reduced by nearly 8% from the 60˚ result for 6MV at 8cm off-axis to heel. It is found that the level of disagreement between the two methods declines as the wedge angle decreases from 60˚ to 10˚. A comparison between the extended MU Fraction Approximation and the shift method for the determination of the total enhanced dynamic wedge factors is introduced in [Figure 1] for 6MV and in [Figure 2] for 18MV photon beams having a 20x20 cm 2 field size. 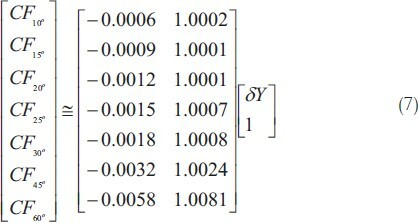 The form of the identified correction factors and solutions are presented in [Figure 3] and [Table 1] for 6MV and in [Figure 4] and [Table 2] for 18MV. Upon inspection, one notes the strong linearity in each plot versus wedge angle. Mathematical fit analysis, applied from this supposition, revealed a matrix of linear equations which can be used and applied to the end result of the MFA theory for acceptable results. The matrices are presented below where 6MV solutions are shown as Equation 6 and 18MV solutions are shown as Equation 7. Each matrix consists of a set of linear equations, where CFq is the correction factor and δY is the displaced distance of the point of calculation from the center of the field. The value δY is given as δY=Y POI -Y 0 . Each linear equation has the form CFq=m(δY)+b, where new parameters involved are simple linear constants (m and b) identifiable within the form of each matrix. Thus, the correction factor depends only on the point-of-interest separation from field center. 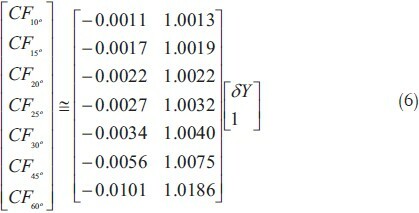 [Table 1] and [Table 2] show CFq in numerical form for 6MV and 18MV respectively. For example, for a 6MV beam involving the 60˚ EDW, the correction equation is CF 60˚ =-0.0101(dY)+1.0186. With a field size having y 1 =6cm and y 2 =10cm, the point of calculation is placed at location Y=+1cm arbitrarily off-axis from the central axis toward the toe. For a wedge-OUT mode, the displaced distance of the point of calculation located from the center of field is given as dY= (1cm)-((-10cm+6cm)/2)=3cm. The center of the field is at Y=-2cm and the calculation point is located at Y=1cm. The point of interest is thus towards the toe by 3cm with respect to the center of field. The fact that CF 60˚ is positive is a hint that one should arrive at a factor δY<1.000 due to overestimation by MFA theory in this toe direction. The result for the correction factor is then calculated as follows: CF 60˚ =-0.0101δY+1.0186=-0.0101(3)+1.0186=0.988. This result can be seen equally in [Figure 3] or in [Table 1], at 3 cm off-axis (positive) with respect to the center of the field. For this scenario, a value of EDWF MFA =0.656 is found under the MFA theory and a value of EDWF Shift =0.645 is found under the shift theory. The disparity between the two is +1.7%, as shown in [Figure 1]. Again, the extended MFA theory overestimated the resulting total EDWF in the toe direction. As a result of solving the proposed equation, one may arrive at the corrected value for the total enhanced dynamic wedge factor from EDWF MFA × CF 60˚ = (0.656)(0.988)=0.648. This agrees well with the shift method result for the EDWF. Analysis of capabilities of the matrix reveal maximum difference in the shift method and this correction method to be < 0.4% for symmetric fields and < 0.8% for asymmetric fields. Handling corrections of this nature is not limited to the span of the tables and plots presented here, as the correction factor exists in analytical form. Successful results can be obtained when the point of calculation is even farther off-axis, when, correctly reviewed. The MU Fraction Approximation has some shortcomings. Certainly in this theory, points closer to the center of the field result in more accuracy. Large field sizes with considerably different asymmetrical arrangements, however where larger EDW angles are used, result in errors beyond 5%. [ 19],,, These results are a direct consequence of the inherent definitions used initially in the theory. According to this methodology, when the jaw has only moved from the initial position to the point of calculation, the number of monitor units delivered yields the entire dose to that point. We know that there will be an additional dose given from transmission through the upper jaw as it passes over the point of calculation. An additional dose is also given to the point from the radiation arriving side-scattered and back-scattered laterally, beyond the point, as the jaw continues to move onward. This results in underestimation in the heel direction and overestimation in the toe direction. To combat these early inaccuracies, the extension of the MU Fraction Approximation was proposed, forcing the calculation point to be located at the center of the initial open field. This improved accuracy somewhat but continues to limit the user in a clinical capacity. While involved with patient plans, one should not be so concerned with the positioning of the point of calculation exactly in the center of the initial open field. Using upper chest wall planning as an example, critical organs must be removed from the field. This is especially true during certain boost procedures elsewhere as well. The arrangement of critical organs may not accommodate placing the calculation point exactly in the center for all fields, when it is necessary to shape the field to block these structures. To achieve a more clinically acceptable solution, one can utilize a mathematical extension of this methodology, or modify it, thereby permitting the calculation of the total enhanced dynamic wedge factor at any reasonable location in the field. Kuperman has shown his shift method to work well as a modification of the extension theory. Although the limitation for the position of the calculation point was removed, the form of the equation even longer than Equation 4 from which it was contrived. Clinically, it is difficult and extremely time consuming to produce data and calculate enhanced dynamic wedge factors from it. This stands as an extreme limitation for medical physicists to not only understand the MFA as well as the extensions of it from Gibbons, Wichman and Kuperman, but also to have the ability to use it. With the perception that none of these methods are widely used clinically for mathematical checks, most facilities will not have an in-house Physics Data Book with EDWFs and EDWOARs in them. Here, with only one variable to contend with, dY, representing the displaced distance of the point of calculation from the center of the field, the linear equations can be simply used to determine the computational correction (CFq) of the Gibbons MFA Extension, yielding the final total enhanced dynamic wedge factor (EDWF MFA ). Further, the form of their presentation will permit rapid production of in-house Physics Data Book values rather than complex equations. The example presented in the Results and Discussion Section explains their simple use. We have shown how the MFA extension theory can be corrected directly with highlighted accuracy. The total enhanced dynamic wedge factor can be computed to within 2%, using the correction matrix as it applies to the extended MU Fraction Approximation. Analysis of the capabilities of the matrix shows the maximum difference between the shift method and this correction method to be < 0.4% for symmetric fields and < 0.8% for asymmetric fields. The Analytical Correction Method works significantly well for the Varian model 21EX and 6EX medical accelerators. It may work equally as well for other models which also utilize the segmented treatment tables for dynamic wedge use. Since other manufacturers make use of differently constructed and operated multi-leaf systems, this data is not recommended to be used with different accelerators. Further, the total enhanced dynamic wedge factor should always be measured prior to use in this modality. It is encouraged that facilities make use of these equations only for a magnitude check on the factor if involved in computational verification. We would like to thank Dr. Vadim Y. Kuperman, Dr. Chihray Liu and Dr. John P. Gibbons for candid and explanatory communications about their previously published works on total enhanced dynamic wedge factors. 1. Gibbons, JP. Calculation of enhanced dynamic wedge factors for symmetric and asymmetric photon fields. Med Phys 1998;25:1411-8. 2. Varian Medical Systems, Inc. C-Series Clinac: Enhanced Dynamic Wedge Implementation Guide. Palo Alto (CA): Oncology Systems / Delivery Systems; 2006. 3. Gibbons JP, Roback DM. Monitor Unit Calculations for Photons and Electrons: Report of TG-71. American Association of Physicists 46 th Annual Meeting; Pittsburgh, PA: 2004. 4. Klein E, Low D, Meigooni A, Purdy J. Dosimetry and clinical implementation of dynamic wedge. Int J Radiat Oncol Biol Phys 1995;31:583-92. 10. Liu C, Waugh B, Li Z, Zhu TC, Palta JR. Commissioning of the enhanced dynamic wedge on a ROCS RTP System. Med Dos 1997;22:231-6. 11. Salk JE, Röttinger EM. Calculation of effective Enhanced Dynamic Wedge Factors from Segmented Treatment Tables for symmetric and asymmetric photon beams. 1-8. Palo Alto (CA): Varian Associates; 2000. 14. ADAC Laboratories. ADAC Pinnacle 3 Treatment Planning System, Version 6.0, Milpitas, CA. 15. Varian Medical Systems, Inc. Varian Eclipse Treatment Planning System, Version 6.5, Palo Alto, CA. 16. Miften, M, Weismeyer, M, Beavis, A, Takahashi, K and Broad, S. Implementation of enhanced dynamic wedge in the Focus RTP System. Med Dos 2000;25:81-6. 17. Redpath T. A generic computer program for checking photon beam dose calculations. Brit J Radiol 2003;76:904-8. 18. Gossman MS, Robertson MA, Lawson RC. Correlation between detector array measurements and a computer algorithm for enhanced dynamic wedge profiles. Med Dos 2007;32:211-5. 22. Chang SX, Gibbons JP. Clinical Implementation of Non-physical Wedges. American Association of Physicists in Medicine, Refresher Course; 1999. p. 1-13.